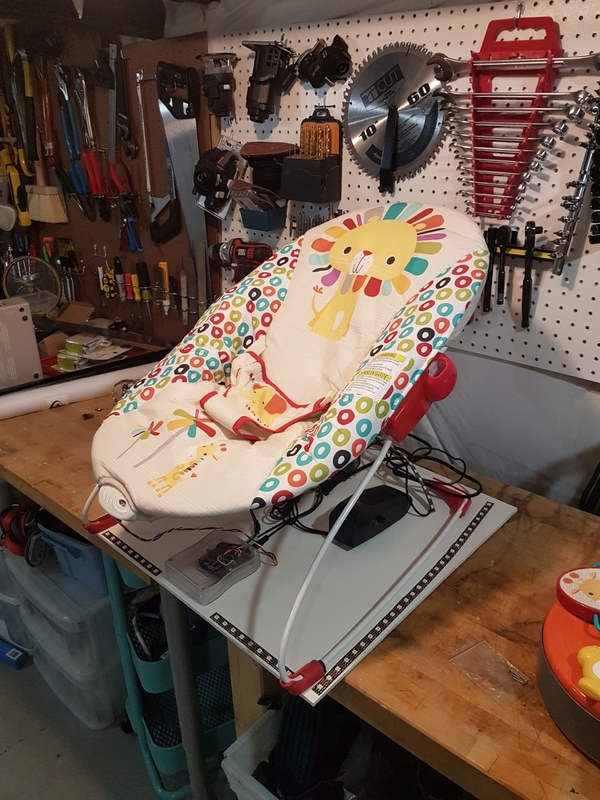 It all started because a friend sent me a link to a baby crib that Ford made. Ok, what’s going on here? The VOM3K is designed to replicate every aspect of riding in a car. The seat vibrates to varying degrees much the way a car will turn on, drive for a bit, stop at lights, etc. The seat lights up on the sides in a pulsating way just like a car’s headlights will light up the cabin. 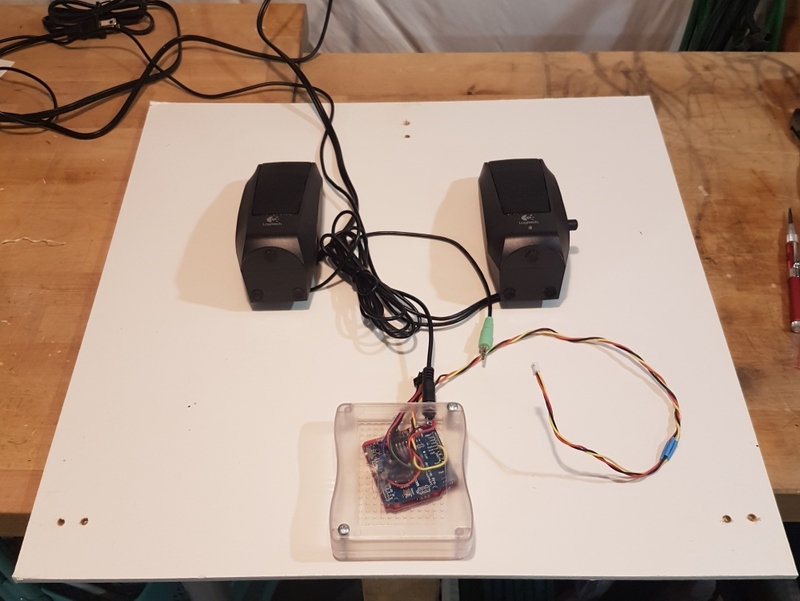 And the speakers play a recording of road noise recorded during a 15 minute drive. You will need a soldering iron, solder, general soldering accessories, and tools to connect the project. Mini Diagonal Cutters. These are great little cutters! A must have for clipping leads and extra solder tails. 4" long. 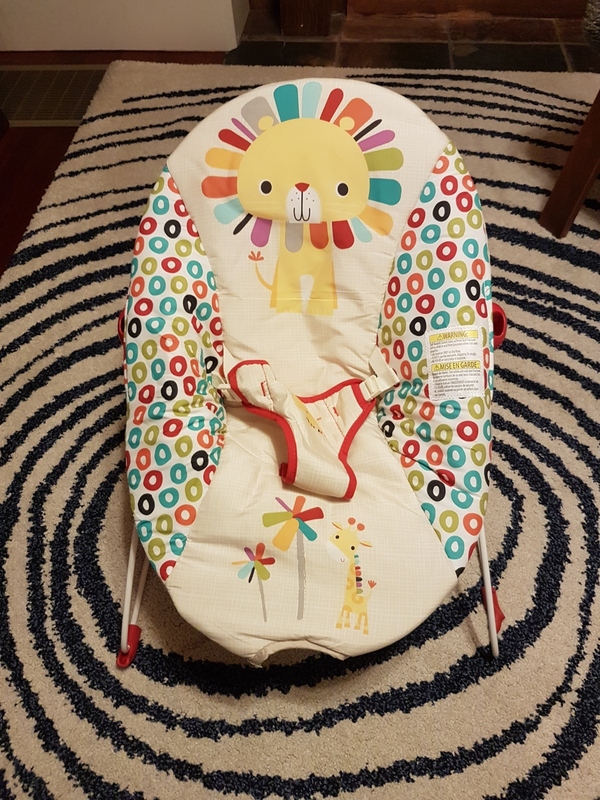 Luckily, the bouncy seat that friends gave us (thank you Victoria!) 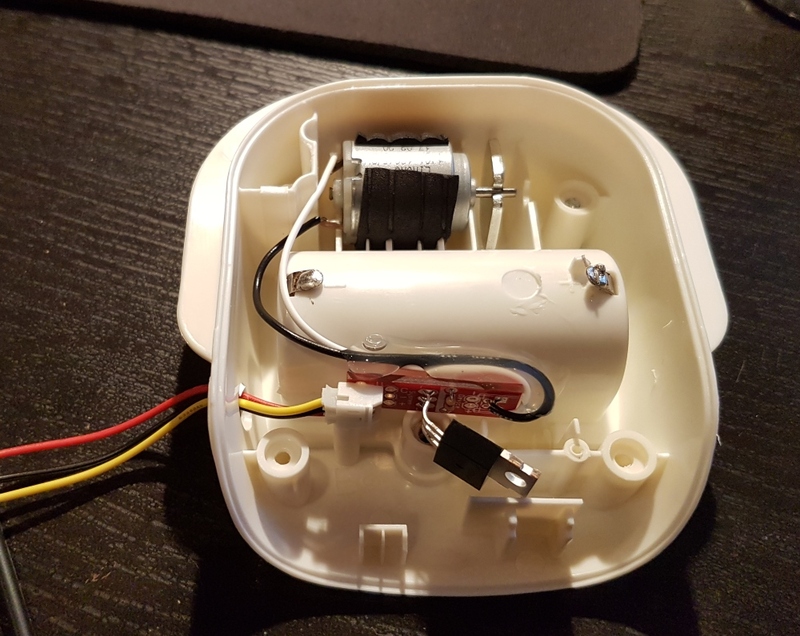 had a small vibration motor attached. The original vibration design used a single C cell battery (approximately 1.5V) with a simple ON/OFF slide switch. I removed the power switch and battery and used the MOSFET power control kit to control the motor via the Arduino at 5V. Since the DC motor was used to vibrate the seat, it did not matter what pin was used when connecting it to the "Device" side of the n-channel MOSFET's breakout board. What does the motor do when run at 5V instead of the designed 1.5V? It runs a lot faster and a lot louder. Thankfully, the Arduino has PWM on a handful of pins so we are able to run the motor from 0 to 100% throttle. Therefore, if the vibration is too great (or the motor gets too warm), we can ramp down the power to an acceptable level. I ended up running the motor from about 40% to 80% power. Any higher and the boy gets even more weirded out. Next, I soldered an Arduino Pro to the MP3 Player Shield. Note that the Arduino is mounted above the shield. 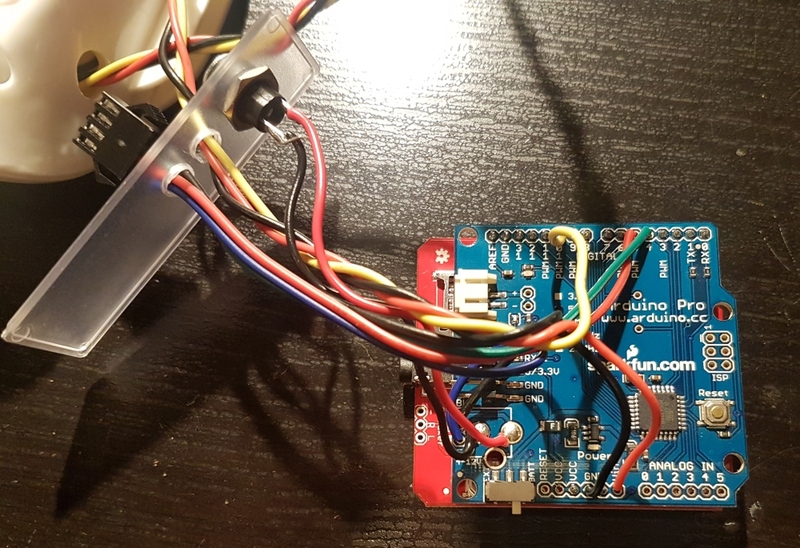 It’s not mandatory that an Arduino go below a shield. I knew I was going to need to solder a variety of additional things like switches and buttons to the Arduino. It was easier for me to mount the MP3 shield below so I could see the pins I needed to access on the Arduino. After stacking, the following wired connections were made as shown in the following table. I made a base board out of MDF to mount everything to. I had some extra paint around so I painted it (thinking a coat of paint would have a positive impact on my wife’s feelings about this whole endeavor). The speakers are attached with a couple of screws through the MDF into the plastic speaker housing. The enclosure and electronics were similarly secured with a couple screws. The chair was then zip tied to the MDF. The individually addressable APA102 warm white LEDs had an adhesive backing like most strips do. But like most LED strips, this backing tends to wear out after a few days so I added hot-glue to various points on the LED strip to secure it. The APA102 LEDs are controlled with the excellent FastLED library. The ‘Cylon’ example was modified to mimic car’s headlights illuminating the cabin as they pass on the left, right, and front. Next, I recorded a 12 minute drive through my city with the windows down. If you listen to the track you can hear where a couple large diesel trucks pass by. It’s a pretty good track although it’s hard to pick up good road noises. At one point I envisioned using a light sensor, GPS, and accelerometer to properly record the light and vibration through the drive. 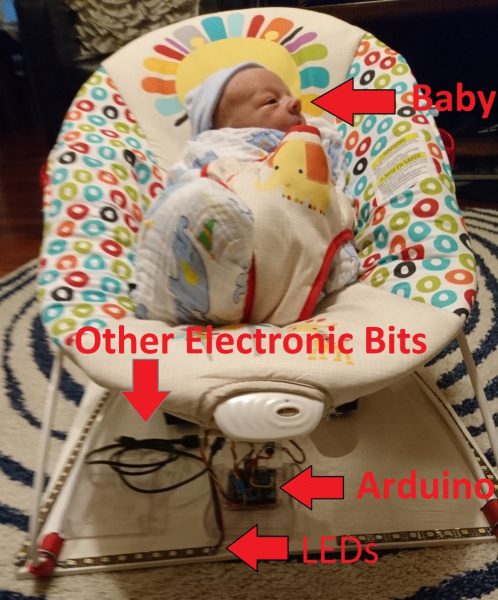 At that same moment my son started to scream and I decided it was better to take the SISI (screw it, ship it) approach: the LEDs trigger every 30 seconds with a random right/front/left decision and the vibration motor changes to a new, random, vibration level (40 to 80% throttle) every 60 seconds. 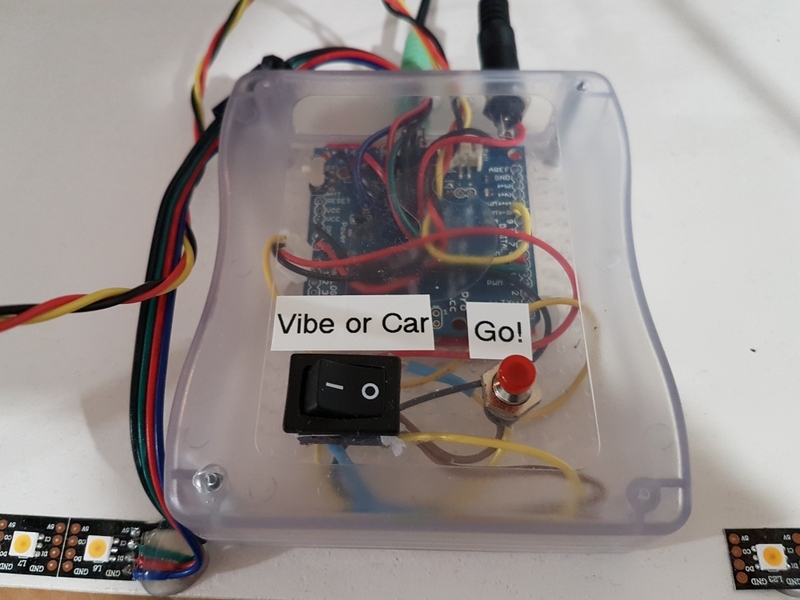 A rocker switch was used to select between Vibe (vibrate for 15 minutes, no lights or sound) and Car (the full effect). The Go! button allows the user to start or stop an action. It looks at the state of the rocker switch and the start button to determine what to do. Once actuated the MP3 shield plays the track until completion. The LEDs and motor turn ON/OFF randomly every 30 and 60 seconds, respectively. There’s also a vibe-only mode that vibrates the chair for 15 minutes. In the end, Jack doesn't really like or dislike the seat. I suspect the snugness of car seat is important. I also think the vibrations in a car are at a lower frequency and a much higher amplitude than the small vibe motor can do. I hope someone can learn from my lessons and do an even better version! How to get your Arduino groovin' using the MP3 Player Shield. Lumenati is our line of APA102c-based addressable LED boards. We'll show you how to bring the sparkle to your projects! Thanks for reading! Please let us know if you have any questions or comments.